Fiction – paperback; Granta; 122 pages; 2014. Translated from the Italian by Archibald Colquhoun and Arthur Oliver. Short. Sharp. Powerful. 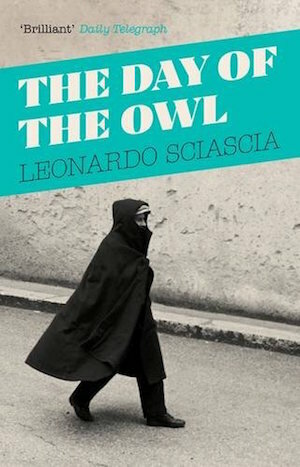 That’s the best way to describe Leonardo Sciascia’s The Day of the Owl. First published in 1961 and set in the early 1940s, this novella looks at the difficulty one policeman faces when he tries to investigate a crime. The setting is Sicily, where the mafia has infiltrated almost every aspect of society. Even the average citizen on the street closes ranks when the Carabinieri start asking questions. The book opens in rather dramatic fashion. A man in a dark suit is running for a bus when he is gunned down in broad daylight. He is only metres away from a fritter-seller and there are dozens of passengers on the bus, yet no one sees a thing. What follows is a complicated narrative tracing the investigation into the man’s murder led by Captain Bellodi, an outsider and “mainlander” who heads up the Carabinieri. His quiet pursuit of the truth is intertwined with the voices of those who want to obfuscate his work, and yet he never gives up or takes short cuts to reach his desired outcome. Captain Bellodi […] was by family tradition and personal conviction a republican, a soldier who followed what used to be called ‘the career of arms’ in a police force, with the dedication of a man who has played his part in a revolution and seen law created by it. This law, the law of the Republic, which safeguarded liberty and justice, he served and enforced. But while this book might have the look and feel of a crime novel, it doesn’t follow the conventions of the genre. There’s no neat ending, no redemption. What it offers is an honest and authentic look at a society that has been subjugated by a small band of powerful and immoral men, who have rewritten the rules of engagement and live by their own code of honour. It is particularly good at showing what happens when bystanders turn a blind eye to crime, violence and corruption. This tautly written story, which has been pared back to its most basic elements, is an incredibly nuanced piece of work (the dialogue is exceptionally good) and is a wonderful portrait of Sicilian society at a particular moment in time. But it’s also difficult to follow. We are introduced to an endless cast of characters — informers, criminals, politicians, shopkeepers et al — and there’s a disturbing lack of place names (everything is referred to by initial), which makes for a sometimes confusing and frustrating read. Yet for all the difficulties I had with this book, I’d like to return to it at a later date. It’s short, yes, but it’s so dense with ideas and ethical issues that it would take multiple readings to come to grips with them all. I can only imagine how explosive the book might have been had it included everything he really wanted to write! Fascinating! I’ve read one title by Sciascia (a short work rather sarcastically titled “A Simple Story”) and it’s clear that the politics and shenanigans in his part of the world certainly make it hard for anyone to bring a criminal to justice! It sounds like Sciascia made a career out of writing about the injustice and corruption he saw around him. I’d be keen to read more by him, but I now know not to assume a slim book will be an easy read! Sounds interesting – something I’ve never read about before! I have a friend whose family emigrated from Sicily, and she took a long time to tell me that, as if she were embarrassed about it. It’s sad, I think, that she feels tainted by the place she comes from. Funnily enough I have always wanted to go to Sicily. It’s supposed to be very beautiful. I didn’t really get that impression from The Leopard, it seemed more arid than beautiful. No, you might be right. Wikipedia has photos of some gorgeous buildings in Palermo. It’s stunning, Kim. If you have the opportunity to go there, do it. Being a policeman in Sicily sounds like a job from hell. I remember reading while we were driving through that island that Sicilians consider rules of the road to be mere suggestions…. so they feel no compunction to obey one way signs, no parking here signs….. I really enjoyed your review of this novella, Kim. I’ve read three or four by Sciascia and this is my favourite so far. He’s very insightful when it comes to shining a light on the corruption that can exist among the authorities and those in positions of power. Thanks Jacque… what others would you recommend? I’m intrigued by The Moro Affair but wonder if my lack of knowledge about Italian political history might hamper my enjoyment. I would recommend Equal Danger as the style is similar to Owl. His short stories are worth considering too, especially for their diversity – The Wine Dark Sea is an excellent collection. I’ve reviewed both of these over at mine if you need any more info. Sounds fascinating as well as confusing. I don’t mind being a little confused when reading a novel but a little bit of research can alleviate the problem. I’ve just read ‘The Leopard’ along with Lisa & Dagny and it would be an interesting contrast to that book. Yes, I’ve just read Lisa’s review of the Leopard … seems the book was translated by the same chap who helped translate this one. Yes, I noticed the same translator. I’ve only read the short stories of Wine Dark Sea but have always intended to go on to read one of his novels. Apollo recently published a historical novel of his, The Council of Egypt, which could be interesting! I’ve just looked up The Council of Egypt and it does sound rather good. I think Apollo is bringing some rather wonderful books back into print. I also recommend Wine Dark Sea. Thanks, Emma, will look it up.